How do you define a “fit person?” Is a skinny man weighing 135 lbs. who can run a 10K in 50 minutes fit? But what if he can’t bench press his body weight? How about, at the opposite end, a muscleman with biceps size 14” who can lift a Kia Pride but can’t finish a 15K Run? What is fitness? Sports Illustrated, the leading sports magazine, came up with a criteria of four: speed, strength, agility and endurance. 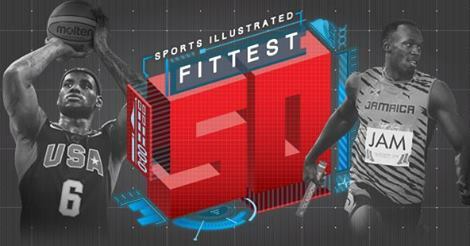 For the first time since the SI magazine started in 1954, they have come up with the “Fittest 50.” With SI’s editors and writers as judges, they’ve used a 40-point scoring system to assess the world’s top sportsmen; each of the four categories has a scale of 0-10. From SI, here are the criteria: STRENGTH: the pushing power of a lineman or the force of an ultimate fighter. SPEED: the top end of a sprinter or the burst of a running back. ENDURANCE: a runner’s bottomless reserve or a boxer’s ability to keep going in a bout. AGILITY: the balance of a downhill skier or a euro step at full. He’s Cavalier No. 23! Yup, in all four categories, SI scored LeBron James a perfect 10. His total is 40. Based on this analysis by their experts, he’s the only top-notch athlete to score a perfect mark. LBJ is strong and fast; he can endure a lengthy contest (except that cramps in Game 1, right? ), plus his balance and agility are incomparable. The second best: Christiano Ronaldo. The Portuguese scored 10 in three areas but only 8.5 in strength. Understandable because a footballer needs speed, endurance and agility — minus the bulging muscles which will slow him down. Ronaldo scores 38.5. Third on the list is Usain Bolt. The fastest human being ever (his 100-meter WR is 9.58), he scores a 10 in speed (of course) but lower in strength (9), agility (8.5) and endurance (9). Bolt scores 36.5. From fourth to 10th place are: Floyd Mayweather (score: 36), NFL’s Dez Bryant (35), NFL’s Calvin Johnson (34.5), NBA’s Serge Ibaka (34), NFL’s Adrian Peterson (33.5), Jon Jones of the UFC with 33, and at No. 10, the world’s most decorated swimmer, Michael Phelps (33). Blake Griffin, the LA Clippers slam-dunking Hulk, sits at No. 14. He totaled 30. A bit perplexing is how he scored only 8 in strength (he got 7 for speed and 7.5 for agility and endurance). Isn’t Griffin one of the league’s strongest? Among the tennis players, only two made the list: Rafael Nadal and Roger Federer. Nadal is ranked 20 while Fed is 31. With Nadal, another head-scratching number: the man who can battle for five hours and five sets only scored 8 for endurance. Ha? Nadal’s total is 28.5. As to Roger, he got a lowly 5.5 for speed and his total is 26. But why no Novak Djokovic? With the MMA fighters, only one other star is included apart from the 9th-ranked Jon Jones. He’s GSP or George St. Pierre. The Canadian is middle of the pack, No. 25, for a total of 27.5. He scores a high 9 for strength but a low 3.5 for speed. Among the NBA players, the six total include Ray Allen (30), Nate Robinson (33) and Dwight Howard (36). Cyclist Chris Froome is 45 and marathoner Meb Keflezighi is 46. Pinoy? Yes. Adjudged the 39th fittest with scores of 6.5 (speed and agility), 6 (endurance) and 5 (strength) for a total of 24 is the planet’s only eight-division world champ, MP.